Half Film At Number 2 in the KBRP CMJ Chart!!! The sublime slowcore of Half Film has made a big impact on Arizona’s KBRP. The double album re-issue of the bands two late 90’s/00’s debut and sophomore releases are sitting at number 2 on the KBRP CMJ chart. 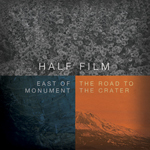 If you’ve not yet fallen to the charm of East of Monument and The Road To The Crater then head to the Hidden Shoal Store and stream both albums in full to understand why you must own them. The CD release comes as a specially priced double CD with both albums in a double gatefold. Liminal Drifter Top NACC College Radio Adds! Liminal Drifter Riding the US Radio Charts!